Volume II surveys the wreckage blotting the landscape of “progressivism,” a barrier island to Communism’s landmass. Here we find the unbroken bridge linking Communism to the received wisdom of the vast majority of academics in the West, who download them into vulnerable students en masse. The Marxist vision that sustained Stalin’s supporters in the 1940s and 1950s is alive and well in the post-colonialist and identity obsessions of postmodern theorists. Utopians then, utopians still, Horowitz finds their vision of social justice is still attended by the same suppression of “incorrect” thought and speech, the same self-righteousness, the same illiberalism in dealing with critics and apostates that were – are – the hallmarks of Communism. Progressives may refer to themselves as “liberals,” but that is a misnomer Horowitz strenuously proscribes. Classical liberalism in our culture was largely vanquished in the counter-cultural revolution, though the odd grey-haired academic adherent pops into view now and then, seeming baffled by what has become of the noble assumptions of his youth. Referring to leftists as liberals launders their intellectual and political lineage. Real liberals – especially liberal scholars – don’t excommunicate their peers for deviating from the party line. Communists did; New Leftists did (as Horowitz learned first hand when he left the movement and his entire circle of “friends” renounced him); and progressives still do. According to Horowitz, Kraditor, a feminist historian in good – even iconic – standing during the years she was a card-carrying Communist, was virtually “disappeared” from the feminist movement when she renounced Communism. Horowitz provided a mere thumbnail sketch, praising her work, and explaining why this once-admired scholar of the suffragette movement now languishes in near-obscurity, but it was enough to pique my curiosity. In his book Disinformation, Ion Mihai Pacepa, the highest-ranking Soviet Bloc official ever to defect to the United States, describes the Soviet intelligence practice called “framing” – changing someone’s or something’s past to suit present political needs. Yuri Andropov is discussing the operation to put the drugs and the documents into the apartment and then five pages later is discussing my father being a drug trafficker and a spy. You see, there’s a self-intoxication here. You create the lie and then somewhere along the process you begin to believe that lie that you yourself have created, and this is a very fascinating phenomenon. Jamie’s boss, David Horowitz, lived this lie for many years. He knows that without lies, the ideology of the left would cease to exist. This is the central truth Horowitz relentlessly reinforces in Progressives, Volume II of The Black Book of the American Left. To be a conservative is first to understand that there is no solution to the dilemmas of the human condition. Second, it is to understand that to escape these dilemmas, human beings will inevitably embark on desperate quests for redemptions in this life. These redemptions, in turn, will require holy wars to purge the world of demons—of those who do not share their faith, and who stand in their way. In this regard, totalitarian Islam is really no different in its heart from totalitarian socialism or progressivism, even though the latter are secular and the former is pursued in the name of a vengeful and malignant God. Both seek to cleanse mankind of its irreparable imperfections. To remain free beings, we are continually forced to defend ourselves and our breathing space, against the efforts of the redeemers to perfect us—against the armies of the saints who are determined to make the world a better place than it can ever be. That is how I see the political wars we face, and why they will never end. David Horowitz’s “The Black Book of the American Left: Collected Conservative Writings” should be read by every American who loves his country. This book is a unique wake-up call to the truth that America is being infected by the bubonic plague of Marxism, which once contaminated the author himself. In the 1970s, David climbed to the very top of the American leftist movements. Later he understood that Marxism was a lie – the first step toward stealing and killing – and after that he dedicated the rest of his life to warning others that Marxism was endangering American freedom and democracy. A Rasmussen Reports poll shows, indeed, that nowonly 53 percent of Americans prefer capitalism to socialism. America is still not really aware that Marxism is infecting the country because our main media have gone to great lengths to hide this truism, and because neither the Republican Party nor the tea party has called attention to the looming dangers of Marxism. Our main media are also deep-sixing the fact that the only thing Marxism ever left behind it is countries that ended up looking like trailer camps hit by a hurricane, and Marxist leaders roasting in Dante’s Inferno – all of them, from Trotsky to Stalin, from Khrushchev to Brezhnev, from Tito to Enver Hoxha, along with Mátyás Rakosi, Sékou Touré, Nyeree, Ceausescu and Hugo Chavez. David Horowitz was born into a family of devoted Marxists, had Marxism in his blood and pursued a successful career as a Marxist activist, writer and journalist. In 1974, some of his Marxist comrades – leaders of the Black Panther Party – murdered a bookkeeper whom David had recruited to keep the accounts of a Panther school he had helped create. That horrible crime hit home and persuaded David to forsake his highly successful leftist career and to move over onto the other side of America’s political barricade. 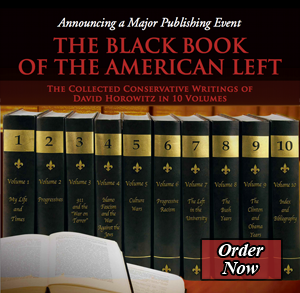 In the preface to “The Black Book of the American Left,” the first of a nine-volume memoir, David Horowitz wrote that “for better or worse, I have been condemned to spend the rest of my days” fighting Marxism, “from which I have separated myself.” In May 1989, he and two other former prominent Marxists, Ronald Radosh and Peter Collier, went to Poland to attend a conference calling for the end of Communism. There, David told the Polish dissidents: “For myself, my family tradition of socialist dreams is over. Socialism is no longer a dream of a revolutionary future. It is only a nightmare of the past. But for you, the nightmare is not a dream. It is a reality that it is still happening. My dream for the people of socialist Poland is that someday you will wake up from your nightmare and be free.” A few months later, the Roundtable talks between the Polish government and the Solidarity-led Polish dissidents led to the first semi-free elections in the Soviet bloc. On Nov. 9, 1989, when I watched on television as the Berlin Wall was being torn down, my eyes were misty. I was so incredibly proud to be an American. The whole world was expressing its gratitude to the United States for its 45 years of successful Cold War against the Soviet evil. “Communism is dead!” I heard people shout. Indeed, Communism was dead as a form of government. But it soon proved that Marxism, which had just celebrated its 141st birthday, had survived. David Horowitz now documents that a new generation of Americans, one that is not being taught history anymore and knows little if anything about our country’s long fight against Marxism, is giving this heresy – which killed over 90 million people – another lease on life. In 2008, the Democratic Party portrayed the United States as a “decaying, racist, capitalist realm,” unable to provide medical care for the poor, to rebuild her “crumbling schools,” or to replace the “shuttered mills that once provided a decent life for men and women of every race,” and it pledged to change it by drastically increasing taxes on the American rich, American businesses and their owners, in order to finance programs for the poor. This is Marxism at its best. In “The Communist Manifesto,” Marx painted capitalism as “a decaying, racist realm,” and pledged to eradicate it by advocating 10 “despotic inroads on the rights of property,” which became known as the “Ten Planks of the Communist Manifesto.” Among them: a heavy progressive or graduated income tax; abolition of all rights of inheritance; abolition of property. If you know the “Manifesto,” as David does, you will think Marx himself wrote the Democratic Party’s economic program, which contains all of the above planks of Marxism. If you don’t know the “Manifesto,” glance through “The Black Book of the American Left.” Young people, as David was when he ignored Stalin’s unprecedented crimes, believe in free lunches. No wonder that during the 2008 election campaign, the U.S. Democratic Party easily filled entire stadiums with young people who demanded that the wealth of the United States be redistributed. Some of those electoral gatherings looked to me like Ceausescu’s revival meetings – over 80,000 young people were gathered in front of the now-famous Greek temple resembling the White House that had been erected in Denver, to demand that America’s wealth be redistributed. The Democratic Party won the White House and both chambers of the U.S. Congress. In my other life I rose to the top of a Marxist entity – the Soviet empire – which was created by redistributing the wealth of its people, and I had to start my life from scratch, as David did, to escape its tyranny. Redistribution of wealth is disguised stealing – the next step toward killing – and stealing and killing became national policies on the day Soviet Marxism was born. Immediately after the revolution of November 1917, the Soviet Marxists confiscated the imperial family’s wealth, seized the land owned by the rich Russians, nationalized Russian industry and banking, and killed most of the property owners. In 1929, by forcing the peasants into collective farms, the Soviet Marxists stole away their land, along with their animals and agricultural tools. Within a few years, virtually the entire Soviet economy was running on stolen property. When people began protesting the theft, the Marxists transformed the Soviet Empire into a tyrannical police state. Over 20 million people were killed to keep that gulag empire quiet. In the long run, however, theft and crime do not pay even when they are committed by a superpower. The 1991 collapse of the Soviet Union is strong proof to that. On Feb. 7, 2009, the cover of Newsweek magazine proclaimed: “We Are All Socialists Now.” That was also what Ceausescu’s newspaper Scînteia proclaimed when he changed Romania into a monument to Marxism. Two years after seizing power, the U.S. Democratic Party’s Marxism produced the same results as the Ceausescu’s Marxism did – at a U.S. scale. Over 14 million Americans lost their jobs, and 41.8 million people went on food stamps. GDP growth dipped from 3-4 percent to 1.6 percent. The national debt rose to an unprecedented $17 trillion, and it is projected to reach $18 trillion by 2019. Scînteia went bankrupt. Newsweek was sold for one dollar. So, let call a spade a spade: it is Marxism we are talking about. Marxism in America! “The Black Book of the American Left” could not have come to life at a better time. Understanding that Marxism is a lie, and that lying is the first step toward stealing and killing, is what America needs right now. Lt. Gen Ion Mihai Pacepa is the highest-ranking Soviet bloc official ever to defect to the West. In 1989 Romanian president Nicolae Ceausescu was executed at the end of a trial whose main accusations came out of Pacepa’s book “Red Horizons,” republished in 27 countries. His latest book, “Disinformation,” co-authored with professor Ronald Rychlak, was published last June by WND. So what made the born-and-raised communist become the staunch conservative and defender of American liberties that he is today? Among other things, he explained on the Glenn Beck Program Tuesday, it was a deadly encounter with the Black Panthers. It began in the early 1970s, Horowitz explained, when he was introduced to the leader of the Black Panther Party by “a Hollywood producer.” In short order, he helped raise the money to buy a white Baptist church that had been “overtaken by the inner city” in Oakland, and gave it to the Panthers for a school. Horowitz also warned that “you can’t understand what’s going on” in American politics today without realizing the history behind it – the world he was raised in. The full episode of The Glenn Beck Program, along with many other live streaming shows and thousands of hours of on-demand content, is available on just about any digital device. Get it all with a FREE TRIAL.